Neben Stofftieren, Collectors Editions, dem Haustiershop und sonstigen virtuellen Gütern, wie etwa das Celestial Steed Mount, hat sich Blizzard nun die nächste Möglichkeit ausgedacht, um weiter das Geld aus den Taschen seiner Kunden zu leihern. Das Remote Auction House ermöglicht den Zugriff auf das Auktionshaus via normalen Web-Browser, oder sogar mobil mit einem downloadbaren Iphone App, was man sich aus dem ITunes Store herunter laden kann. Man muss sich also nicht mehr extra mit dem WoW-Client im Spiel einloggen, um seine Auktionen zu überprüfen, um somit sein virtuelles Geschäft am Laufen zu halten. Gerade für Leute die viel unterwegs sind, mag dies eine tolle Sache sein, um auch mal von unterwegs die Wirtschaftssimulation Word of Warcraft spielen zu können. Allerdings hat die Sache einen Haken: Der neue Remote Auktion House Service ist nach einer einführenden Beta-Testphase kostenpflichtig und kostet 2,99 für 30 Tage, sofern man alle Features nutzen möchte. Irgendwie werde ich das Gefühl nicht los, das Blizzard damit nun den ersten Premium-Service eingeführt hat, der die Funktionen des Spiels erweitert. Um einen rein kosmetischen Dienst handelt es sich hierbei definitiv nicht mehr. Eine Entwicklung, die ich sehr bedenklich finde. Wie lange bleibt das Armory noch kostenlos? Oder wird es bald ein kostenloses Armory Light und ein Premium Armory für 5 Euro im Monat geben? Und wer braucht das neue Remote Auktionshaus überhaupt? So toll ist der Wirtschaftszweig von WoW auch nicht, als das ich 2,99 jeden Monat dafür ausgebe, nur um virtuelles Geld damit zu verdienen. The World of Warcraft Remote Auction House beta test is now open for business! 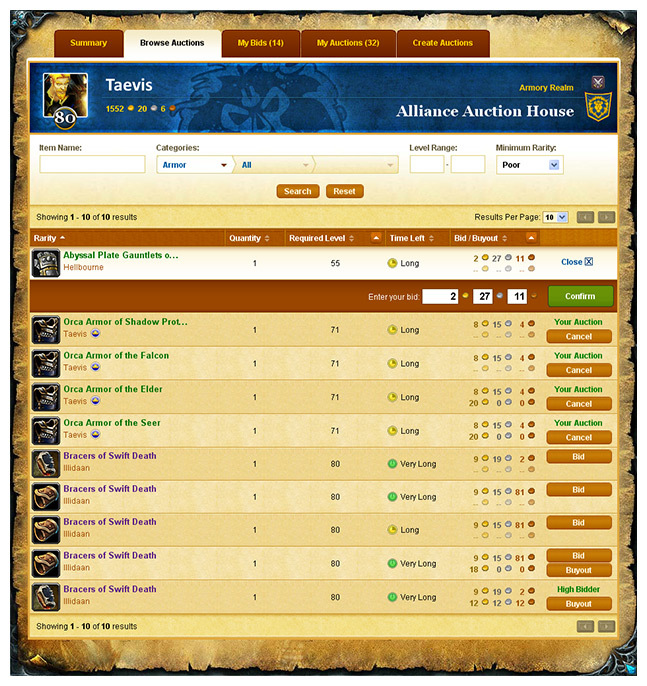 The Remote Auction House is a new service in development that lets players access the World of Warcraft Auction House from the Armory website (http://us.wowarmory.com/auctionhouse/) or the Mobile Armory app for iPhone and iPod touch (http://itunes.apple.com/WebObjects/MZStore.woa/wa/viewSoftware?id=321057000&mt=8). Players can browse their characters’ local Auction Houses with the same search functionality available in the game, as well as see the real-time status of each of their current bids and auctions. The list of realms eligible to participate in the beta test is displayed below. If your realm is not on this list, please check again soon, as we plan to eventually open the beta test to all realms. For more information on the Remote Auction House, refer to the FAQ (http://us.blizzard.com/support/article/REMOTE). We hope you enjoy trying out this new service, and we look forward to hearing your feedback in the thread below. What is the World of Warcraft Remote Auction House beta test? The Remote Auction House is a new feature, currently undergoing beta testing, that allows players to log in to the Armory and browse any Auction House that the characters on their World of Warcraft account have access to. Once beta testing is complete and the Remote Auction House is live, players who subscribe to an upcoming service called World of Warcraft Remote will also be able to bid on or buy out existing auctions; post items for sale from their bags, bank, and mailbox; and collect gold that they earn in auctions or that is returned as a result of being outbid, all through the web or their compatible mobile device. During the beta-testing period, players will be able to try out and test all of these features, including premium features such as making bids and posting auctions, without a subscription to World of Warcraft Remote. How do I browse the Remote Auction House via the web? After you log in and designate a primary character, click on the Browse Auctions tab, and then enter the search term in the field. You can narrow your search using the filters and options, which are similar to those available in the game. To switch between the character’s faction-specific auction house and the realm’s neutral auction house, click the faction symbol in the upper-right corner of the interface. A World of Warcraft Remote subscription will not be required to browse the Auction House in this fashion; however, please note that after the beta test concludes, you will need to subscribe to World of Warcraft Remote in order to bid on or buy out items from the results window. How do I create auctions? 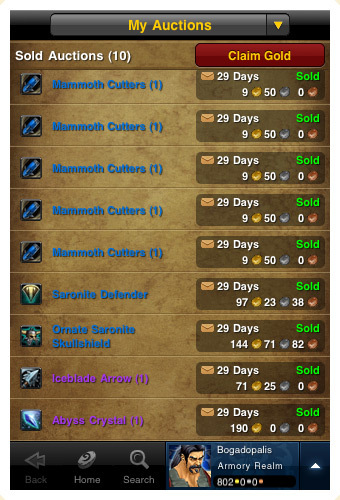 From the Create Auctions tab, select the item you wish to sell from the list on the left side of the screen. You can sell any transferable item (excluding account-bound items) from your bags, bank, or mailbox. Once selected, you can set a starting price, a buyout price, the quantity you wish to sell, and the number of stacks (to create multiple auctions for that item). Please note that after the beta test concludes, you will need a subscription to World of Warcraft Remote in order to create auctions. How can I collect gold from successful auctions and unsuccessful bids? To collect gold from a successful auction, click the My Auctions tab, and then click the Claim Gold button next to the successful auction, or the Claim All Gold button to claim the gold from all successful auctions. The gold will be removed from your mailbox and given to your character. You can also reclaim gold from unsuccessful bids on the My Bids tab. Please note that after the beta test concludes and the live service launches, you will need a subscription to World of Warcraft Remote to use these features. How will I subscribe to World of Warcraft Remote? Subscriptions to World of Warcraft Remote are not yet available; we’ll have more information about how to subscribe after the Remote Auction House beta test concludes. In the meantime, you can visit the World of Warcraft Remote FAQ for more information. Is there a limit to the number of transactions (purchases and sales) I can make? Yes. In order to help prevent abuse of this service, there will be a system in place to limit the total number of Auction House transactions (including bids, buyouts, and creating auctions) that a single World of Warcraft account can perform through World of Warcraft Remote each day. For the purposes of the beta test, the limit is set to 25 transactions per day per World of Warcraft account. When the Remote Auction House beta test ends and the live World of Warcraft Remote service launches, we plan to increase the limit to 200 transactions per day (with a World of Warcraft Remote subscription), though this limit is subject to change. Our goal with this system is to ensure that most players who are using the service will not reach the limit, and we will be continuously monitoring how the service is used and making adjustments to the system as needed. Is the Remote Auction House affected by weekly maintenance? The Remote Auction House will be unavailable during periods of downtime, which includes the weekly Tuesday maintenance period. In addition, during the beta-testing period, the service may be unavailable for periods of time for testing purposes. Who can participate in the World of Warcraft Remote Auction House beta test? The Remote Auction House beta test is open to existing World of Warcraft players on select realms — you do not need to sign up to participate. For a complete list of realms currently participating in the beta test, visit the Remote Auction House Beta Test thread in the official World of Warcraft forums. If you do not see your realm listed, check back later, as we plan to expand the beta test to all realms in the future. Der neue Full HD Beamer ist da – Sanyo PLV Z700	WoW Patch 3.3.5: Ruby Sanctum Loot – Die Beute von Halion und Co.
Tja, Activision melkt die Kunden solange WoW noch welche hat *fg*. Also ich find das garnicht schlecht! Ich mache sehr viele Geschäfte im AH und wenn ich das jetzt auch von Unterwegs, im Büro und zu den unterschiedlichsten Zeiten machen kann, ohne ins Spiel ein zu loggen, dann ist mir das auch die 3 Euro im Monat wert. Klingt für mich wie ein ingame Vorteil, den man gegen reales Geld kaufen kann oder nicht? Es ist eine Funktion die einem in WoW helfen KANN (große Betonung auf kann) wenn man eh schon gerne mit dem AH rummacht. 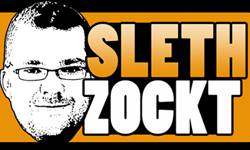 Direkter Vorteil nicht, da man eben auch so schon das AH nutzen können muss um daraus quasi einen Goldvorteil zu ziehen.